A lovely light Thai stir fry with chilli, lemongrass and lime leaves. A marriage made in a wok. 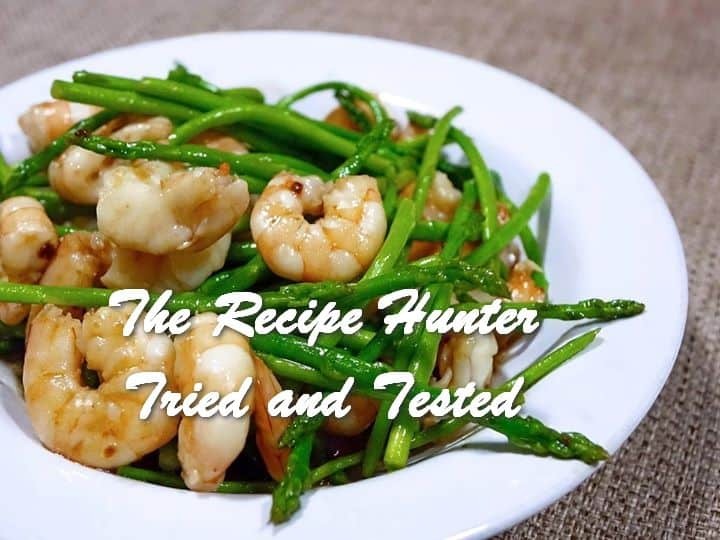 Asparagus and Prawns. 10 Raw King Prawns, you can leave tails on or off your preference. 250 gm asparagus cut in half lengthwise and then cut into 5-inch pieces. Unless you are using Thai asparagus as that is very thin and I just cook whole or cut in half. 1 med onion thickly sliced. 4 spring onions cut into 2-inch pieces. A 1 cm piece of ginger, peeled and finely diced or you can grate. 1 lemongrass stalk bashed and very finely sliced. 4 lime leaves finely shredded. 1tbsp oil. I use coconut oil but veg oil will do. 2 red chillies finely sliced. Mix together the ginger, lemongrass, fish sauce and sugar and set to one side. Heat wok, add oil and when shimmering, add the prawns and cook 1-2 mins or until just pink and remove with slotted spoon. Set to one side. Add onion and stir-fry for 2 minutes, add chillies, garlic and spring onions, this is when the chilli can get quite pungent and hubby exits the kitchen. Pour over the sauce prepared earlier and cook for 3 minutes or until it is sticky. I add my prawns back into the pan after about 2 minutes as I don’t like my prawns overcooked. It is now ready to serve with some lovely steamed Jasmine rice and garnished with coriander.